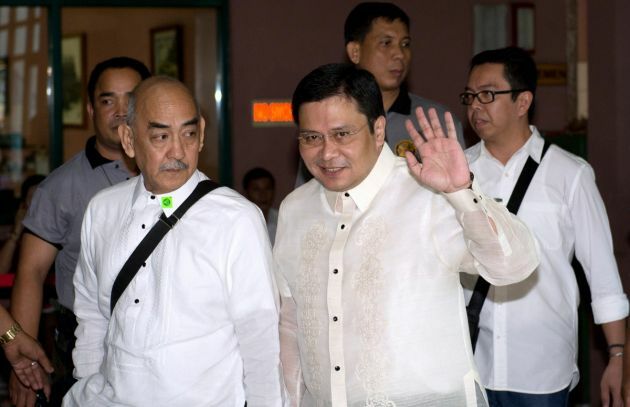 (Photo: REUTERS / Noel Celis / Pool)Senator Jose 'Jinggoy' Estrada (C), son of former Philippine President Joseph Estrada , waves as he arrives at the graft court for his arraignment in Manila June 30, 2014. Jose "Jinggoy" Estrada, is involved a massive corruption scandal, known as the "pork barrel" scandal, with two other legislators, Ramon "Bong" Revilla and Juan Ponce Enrile, and businesswoman Janet Napoles. The "pork barrel" scandal was exposed in 2013 following the surrender of Napoles. Prosecutors, citing government-commissioned reports and witness testimony, said the three senators had siphoned off funds to non-existent non-government organizations for agricultural projects. Many Filipinos believe crime is surging in their country. Church leaders have said calls on the Philippine government to reinstatement capital punishment after a university student died in an apparent initiation incident will not solve a spate of crimes in Manila. The Catholic Bishops Conference of the Philippines asked for sobriety in a statement Wednesday as death penalty advocates renewed their campaign for capital punishment. Capital punishment proponents have claimed the best deterrent to crime is not the type of the punishment, but the certainty that the guilty would be punished. The anti-crime group Volunteers Against Crime and Corruption called for drastic reforms in the country's criminal justice system, including harsher penalties for anti-hazing law violators, uncanews.com reported. The statement was signed by Lingayen Archbishop Socrates Villegas, the conference president. "Rightly has it been said that deterrence lies not in the severity of the penalty but in the certainty that offenders are held to answer for their crimes and the guilty are punished," he said. One anti-crime group, the Volunteers Against Crime and Corruption, said drastic reforms in the country's justice system are imperative, as well as stiffer penalties for criminals. Investigators are still piecing together information that would lead to the identification of suspects involved in the death of Guillo Cesar Servando, 18, a freshman at the College of Saint Benilde in Manila. Servando and at least three other first year students were purportedly beaten up during a fraternity's hazing rites to supposedly welcome newcomers. Hours after the incident on June 28, 18-year-old Servando died. The bishops reiterated that they could not change their position on the issue, saying they have always advocated for the sanctity of life. "Our posture cannot be otherwise. The Gospel we preach is a Gospel of life, but the position we take is defensible even on nonreligious grounds," the statement said. "The aim of justice is the restoration of broken relations and the ruptured social coherence that follow from crime," the bishops noted. "Executing a human person, does not contribute to any of these goals of justice." "We cannot and should not renege on our international obligations, especially when these are not only lawful but moral," the bishops said. Former president Gloria Arroyo repealed the death penalty in 2006.